Honey is a rich source of carbohydrates, providing 17 grams per tablespoon, which makes it ideal for your working muscles, since carbohydrates are the primary fuel the body uses for energy. Carbohydrates are necessary in the diet to help maintain muscle glycogen, also known as stored carbohydrates, which are the most important fuel source for athletes to help them keep going. Whether you're looking for an energy boost or just a sweet reward after a long workout, honey is a quick, easy, and delicious all-natural energy source! During Exercise: Consuming carbohydrates, such as honey, during a workout helps your muscles stay nourished longer and delays fatigue, versus not using any aid or supplement. 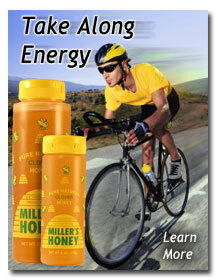 Next time you reach for a simple bottle of water, add some honey – it can give you that much-needed athletic boost! When planning your athletic training program, remember that honey is a rich source of carbohydrates, providing 17 grams at just 64 calories per tablespoon. Combining honey with fruits, vegetables, lean meats, whole grains and other healthful foods can add to your total nutrition and give you a great natural energy boost. Try these tips to fuel your diet with the sweet goodness of honey!